Approaching the Pittsburg Power Plant. Notice the numerous cooling towers on the far left and the large oil tank on the right. Marty Hunt told us the power plant would be on the right, when we turn onto Tenth Street, and we couldn’t miss it. There is no question we are headed in the right direction. Steel towers loom over the countryside holding up power lines that are spread out in all directions across pastures and green hills. After getting our visitor’s passes at the gate, we drive past acres of fuel oil storage tanks. 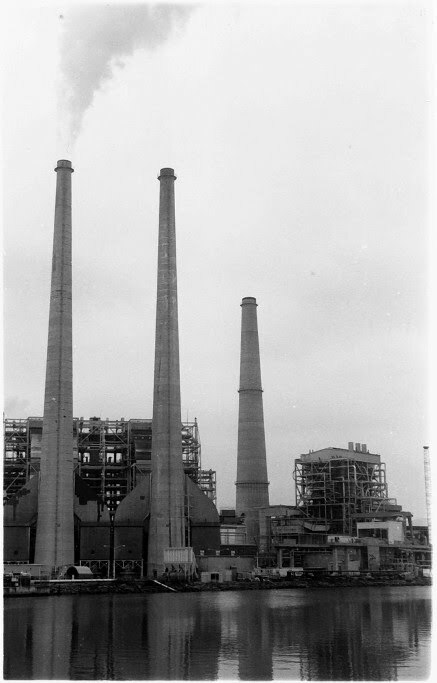 At the power plant itself, seven smoke stacks, each well over 300 feet tall, rise from an immense box-shaped tangle of pipes, duct work, and cables. From one of the stacks a cloud of white smoke tumbles upward, a mixture of water vapor and carbon dioxide. Mr. Hunt, a project manager at a power plant run by Pacific Gas and Electric in Pittsburg, California, meets us outside his office. “This plant, like many electric power plants, has more than one generating unit, each with separate boilers, steam turbines and electric generators,” he tells us. “The Pittsburg Plant is like seven power plants in one. Each can burn either oil or natural gas, but natural gas is almost always used because it burns much more cleanly.” Today only one unit is operating. “It is a good day to look around. A major overhaul of two of the units is in progress. 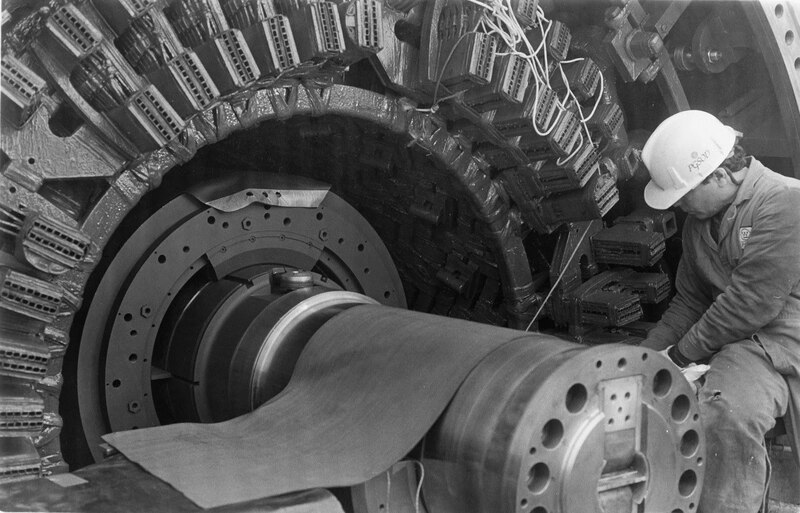 Some machinery is dismantled, giving a good opportunity for us to see the inner workings,” he said. We put on hard-hats and begin the tour. We thread our way up several flights of outdoor staircases to the platform where the generators are being rebuilt. 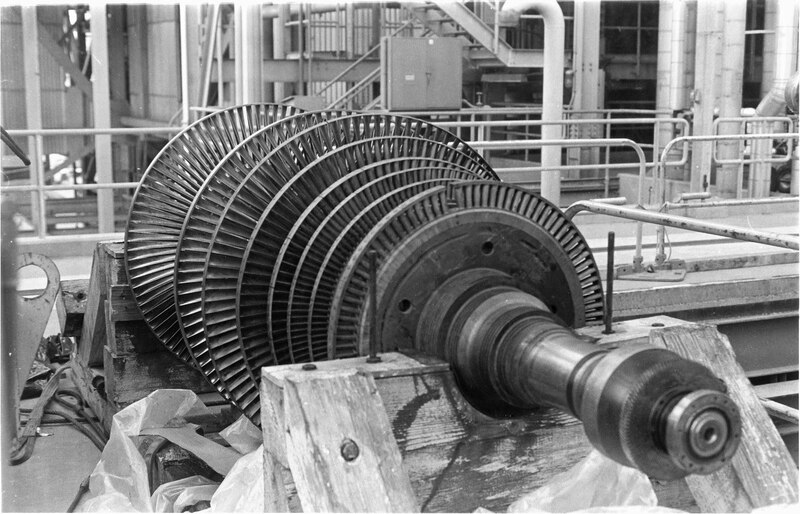 The generator in a typical fossil fuel power plant is spun by a steam turbine. Fossil fuel is burned to boil water in a boiler, creating steam at a high temperature and pressure. The steam from the boiler hits the fan-like blades of the turbine and causes it to turn. This is where the heat from the burning fuel that went into the boiler gets converted to spin the generator. Psi stands for “pounds per square inch.” Right now on every square inch of your body the atmosphere is pushing with a force of about 15 p.s.i. 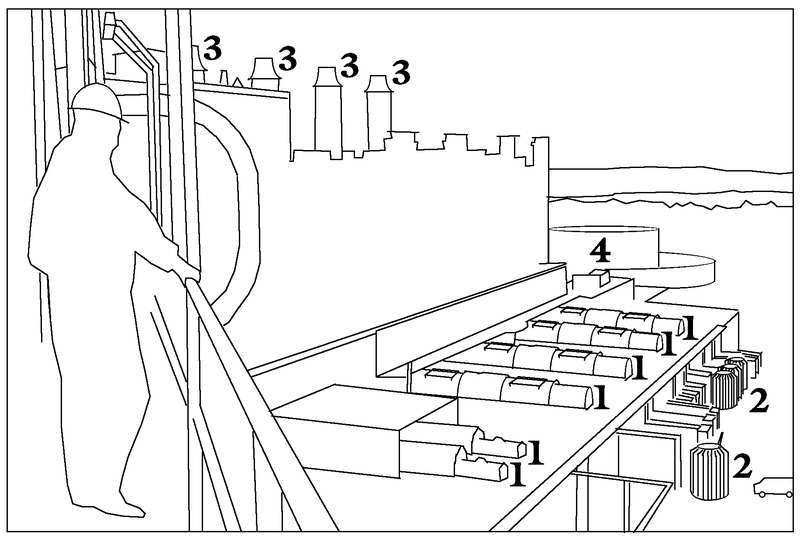 After the steam leaves the turbine it goes to the condenser to be cooled. As steam condenses to liquid water it contracts, reducing the pressure on the output side of the turbine to a small fraction of the pressure on the intake side. How many times greater is the steam pressure in the power plant? The inside of a steam turbine? This (above) looks like a steam turbine, but it actually is a pump. Think of a pump and a turbine as the reverse of each other. In a turbine, a fluid flows past the blades forcing them to turn. In a pump, spinning blades force the fluid to flow. 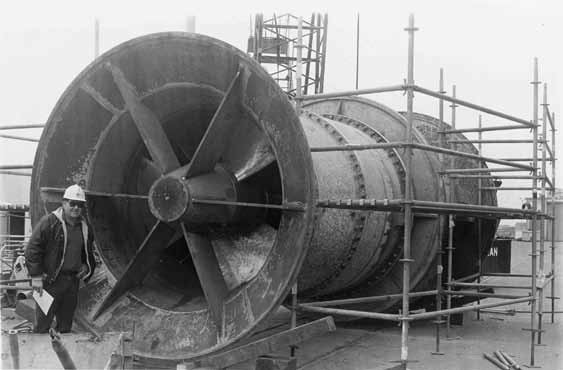 The real turbine is encased in the housing shown in the photo below. If this heated water were returned directly to the bay, its temperature would disrupt the ecosystem. To avoid this thermal pollution, as it is called, the water goes through cooling towers which transfer heat to the air. Cooling towers are a prominent feature of many steam powered electrical generating plants. After passing through the cooling towers at the Pittsburg Plant, water goes through two miles of open channels before it reaches the bay. Even so, the water is warmer than the natural temperature of the bay. The warmth of the water, and the fact that the water contains the remains of small fish that have been sucked through the system, makes this part of the bay attractive to large fish. It is a favorite spot for fishermen. Mr. Hunt leads us through the unit that is operating today. Down at the level of the boilers we feel the heat as we peek at the flames through tiny windows. The heat is well contained. The noise, mainly from fans, is loud. On the wall hangs a bin of ear plugs for workers who have to spend time here. In the Boiler, water is heated to produce high pressure steam. In the Condenser the heat is removed to lower the pressure. The work of the power plant is done in the Turbine by the steam that rushes from the high pressure boiler to low pressure condenser. The Pump feeds the water back into the boiler to begin the cycle again. Which is greater, the work the turbine does or the work needed to run the pump? Why? Up above, where the generator is running, there is not much to see. It is completely hidden in its housing, but you can feel the vibration of the rapidly spinning mechanism. The turbines, the generator, and a pump that pushes condensed water back to the boiler are aligned on a single shaft, which must turn at exactly 3600 rpm (revolutions per minute) to maintain the AC electricity frequency of 60 cycles/second. The electricity from the generators goes through high voltage transformers, in and out of acres of switching mechanisms, and then off across the countryside through power lines. This pump pulls water out of the bay for condensing steam after it leaves the turbine. Marty Hunt stands next to it so we can see the size of the pump. Some of the electricity that is produced is used right at the power plant. All the pumps, fans, generator exciter coils, and other miscellaneous electrical equipment needed to run each generating unit use several megawatts [a megawatt is a million watts]. “We are our own best customer,” Mr. Hunt said. We step into the control room. Three power plant operators are at their desks in front of panels full of switches and monitoring devices that stretch to the ceiling. Emergency warning lights are lit up on top of the control panels. Fortunately, these lights have no significance today because this control room is for one of the units that is shut down. Switches are tagged with labels declaring in bold print, “Man On Line,” so that those systems are not be activated from the control room while a worker, man or woman, is working on it outside. 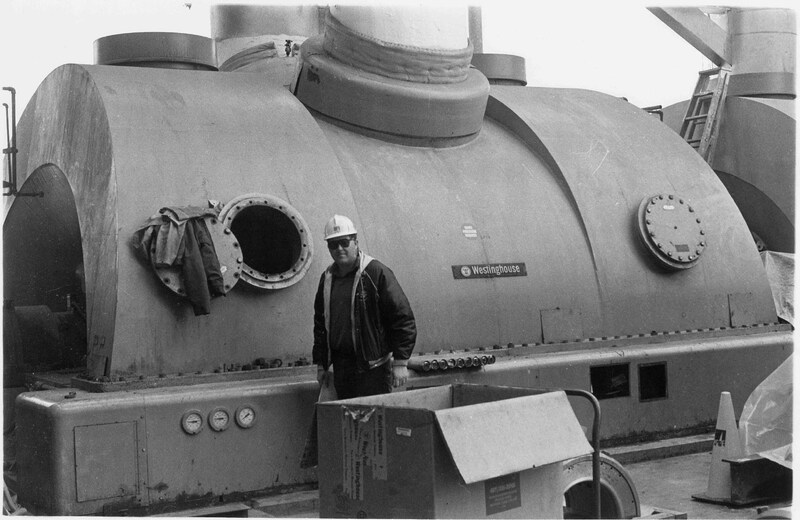 When we ask what is involved in operating a power plant they joke, “You can see we do not need to dress up for the job. Not like in the nuclear plants where they all wear neck ties.” Ron Franklin, a senior control operator who has been at the plant for 21 years, said, “In all seriousness, this job is a challenge. It takes a team to do it. “Even though much of the process is automatic, and some of the work is routine, we are dealing with materials at extreme pressures and temperatures, and equipment moving at rapid speeds generating many megawatts of electric power. We are responsible for the safety of the equipment and the people who work on it twenty four hours a day. “When a steam pipe has a leak or a pump has stopped working the operators must keep the equipment from destroying itself and, if possible, keep the generator running at the same time. “In addition to the control room for each generator there is a system control room for all the power plants in each region of the power grid. We get messages from the system control room in San Francisco about how the grid is operating and how much power is needed from our generator. As we drive home, power lines stretch along the highway beside us. Perhaps they were the ones that carry electricity to the substation in our neighborhood. We left behind a system engineered to provide more than 2,000 megawatts of electricity. When it was built about 50 years ago it produced only a third as much. As people demanded more, additions and improvements were made. We expect additions to continue, especially outside the United States. Demand for power abroad is expected to grow 10 times faster than here. In China alone the use of electricity is expected to grow by 15,000 megawatts per year. That is like opening seven additional Pittsburg power plants every year. 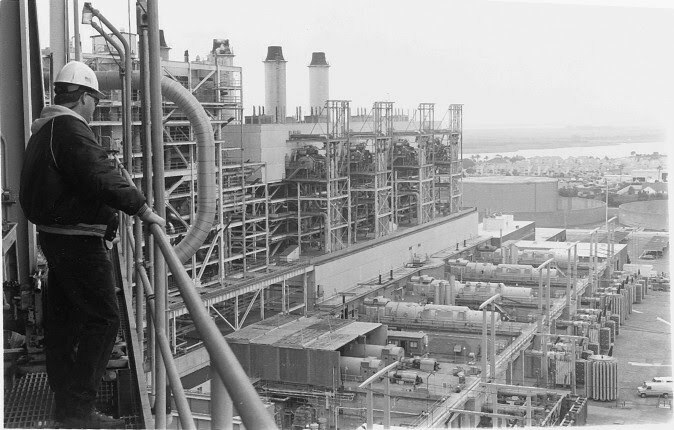 The Pittsburg Plant, like many others, is a fossil fuel burning plant. We wonder how many future power plants the Earth can provide fuel to run? We stop for gas—our tank is low. 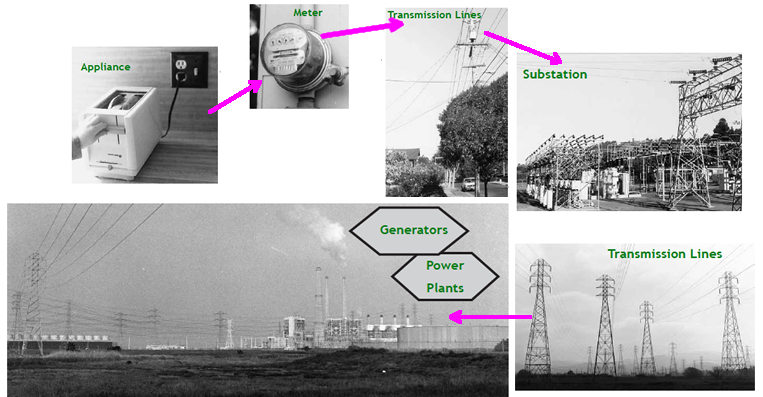 Electric power flows into the grid from a variety of different kinds of power plants. Each kind has its advantages and disadvantages. As you learn about each kind consider the following questions. • What is the source of the energy that feeds the power plant? • What energy transformations occur between the power source and the output of electrical energy? • Is the energy source renewable? What is the ultimate source of the energy that feeds a fossil fuel power plant? What energy transformations occur between that ultimate power source and the output of electrical energy? In the United States, 2,110 power plants burn fossil fuels (coal, oil, and natural gas) generating about 73% of the nation’s electrical energy. 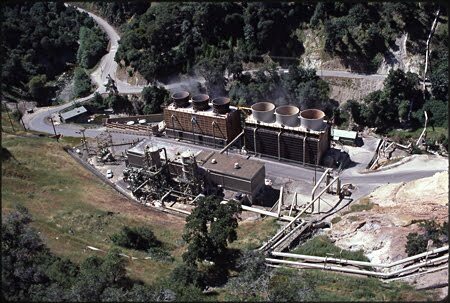 Most of the plants use steam to drive the turbines, like the one in Pittsburg, California. Some of the plants use the hot gases from combustion of fuel to turn the turbine directly, and a smaller number use large internal combustion engines, like those that run cars and trucks, to turn the generators. •	They emit pollutants such as nitrous oxide and sulfur dioxide. • Mining coal and drilling for oil and gas are expensive, dangerous, and often injurious to the environment. •	Transportation of oil has resulted in hundreds of accidental oil spills. • Fossil-fuel power plants are the main source of acid rain. 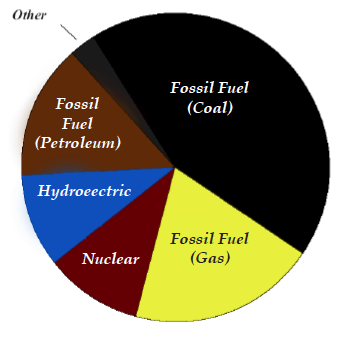 • Fossil fuels are a nonrenewable energy source. Current reserves will be gone long before new ones are formed . • Fossil fuel power plants are major contributors of “greenhouse gases” to our atmosphere—40% of the carbon dioxide added to the atmosphere comes from fossil fuel power plants. All these disadvantages are “hidden costs” that make it difficult to assess the real costs of electricity. Nuclear Power Plant at Diablo Canyon, California Energy comes from a fission reaction that breaks the bonds holding the nucleus of atoms together. That nuclear reaction releases a tremendous amount of heat, which heats water in the dome-shaped containment buildings. 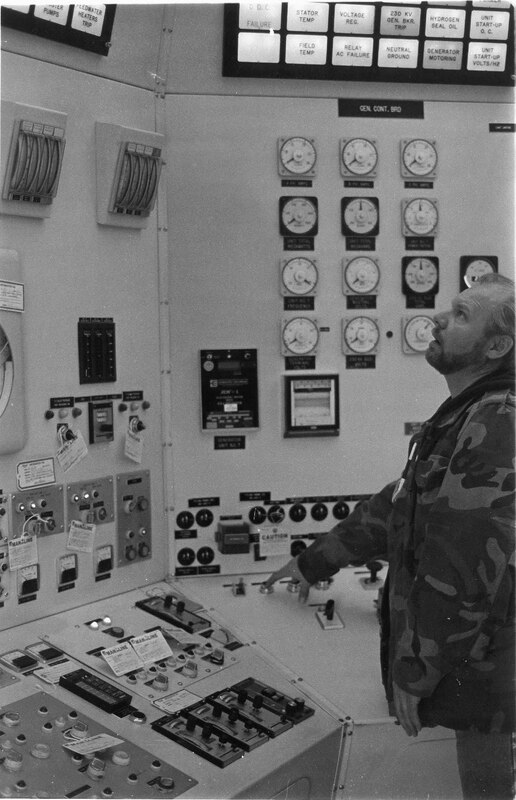 In December 1993, the total number of nuclear power plants in the United States was 109, collectively producing 610 billion kW-hrs of electricity. As of 2004, nuclear power plants were producing about 20% of electric power in the United States. They are fueled by enriched uranium. In nuclear fission, the nucleus of a uranium atom becomes unstable and splits into two smaller nuclei. That splitting produces heat. The heat boils water to drive steam turbines. In normal operation, nuclear power plants do not emit air pollutants or greenhouse gases. Very small quantities of fuel can produce large amounts of energy. Energy analysts weigh these advantages against the following disadvantages. • Uranium is a nonrenewable fuel. • Thousands of tons of highly radioactive waste is left over and stored in containers. The radioactive waste will remain dangerously radioactive for many thousands of years and must be stored in safe waste storage facilities for those long time periods. However, no “permanent storage solution” has been accepted. • Accidents can have widespread repercussions. In the former Soviet Union, the Chernobyl nuclear power plant exploded, spreading radioactive material into the air eventually killing and injuring many people. In the United States, a serious accident was narrowly averted at the Three Mile Island nuclear plant in Pennsylvania. • Waste ores from uranium mines present a health hazard. • Nuclear power plants are costly, and insurance companies will not insure them because the consequences of accidents are so severe. • A nuclear plant operates for 30 to 50 years, and then it must be shut down (decommissioned). Decommissioning a nuclear power plant is very costly, since many components are highly radioactive. No new nuclear power plants are planned for the United States, however Japan and some countries in Western Europe depend heavily on nuclear power. What is the ultimate source of the energy in nuclear power plants? What energy transformations occur in nuclear power plant? The Geysers Geothermal Plant in California. There are no smokestacks at this plant. Notice the mist rising from the cooling towers. Photo courtesy PG&E. Anyone who has seen pictures of lava flowing out of volcanoes is aware that the interior of our planet is hot enough to melt rocks. This heat comes from naturally occurring minerals, such as uranium, which consist of atoms that break down, or decay. When these atoms decay they are changed into lighter elements and they release heat. In some places the molten rock comes fairly close to the surface, but not so close that it erupts as a volcano. However, it may heat groundwater creating hot fountains of water called geysers. These are good sites for geothermal power plants. Power plants that use the naturally occurring heat within the Earth to drive steam turbines are called geothermal power plants. Geothermal energy is a very clean energy source when compared with either fossil fuel or nuclear power. There are a number of sites especially suitable for this, including areas of Northern California, Wyoming, Hawaii, New Zealand, Japan, and Iceland. Hawaii is an excellent candidate for geothermal power production. On the Big Island, where there are active volcanoes, a geothermal project is underway. However, local opposition to this project believes the geothermal plant is an unacceptable intrusion into the local ecology as well as an insult to Pele, the goddess of volcanoes. Nearby inhabitants say toxic fumes are vented and make them sick. A major advantage of geothermal energy is the magnitude of the energy source. The Earth has a tremendous amount of heat in it and our use of that energy is limited only by the technology we can devise to tap it. Though the source is large, it is also unreliable. As steam is drawn from the ground, and as the surface of the Earth goes through natural changes, the energy available at a particular geothermal site can drop. The largest geothermal plant in the world is at Geysers in Northern California. It originally had a generating capacity of 500 megawatts, but currently operates at only 60% of that level. What is the ultimate source of the energy in geothermal power plants? What energy transformations occur in geothermal plants? Solar One Electric Power Plant near Barstow, California. 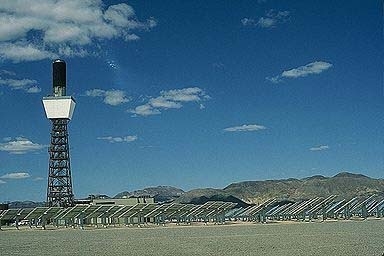 In a solar-thermal power plant, sunlight is reflected by a field of many large mirrors, and concentrated onto a tank of molten salt. The heat of the molten salt is used to boil water and produce steam, which turns a turbine for production of electricity. The mirrors are controlled by computers so they track the Sun along its path across the sky. Solar-thermal power plants have the advantage of being clean energy sources with no fuel costs. The source is considered renewable because sunshine is not depleted. The main disadvantage of solar-thermal electric power is that the energy must be stored or backup systems employed for times when the sun is not shining—at night and on cloudy days. Possible storage systems include storage batteries, pumping water from a low reservoir to a high reservoir for later use with a hydroelectric generator, and production of hydrogen for later use in a fuel burning power plant. What is the ultimate source of the energy for solar-thermal electric power plants? What energy transformations occur in solar-thermal electric power plants? All the power plants described so far depend on the direct use of heat. In each of the power plants we’ve seen, heat, converted to work in a turbine, drives the generator. Such power plants are called thermoelectric power plants. Fully understanding these power plants requires some knowledge of thermodynamics—the study of heat and work. You will find out more about thermodynamics in chapter 8. For now, there are just two things you need to know. 1. Converting heat to work in most thermoelectric power plants is only about 30% efficient. That means that 70% of the heat is not converted to electricity. The wasted heat is carried away by hot water from the condenser. 2. The inefficiency of a thermoelectric power plant is not because of poor design. According to the laws of thermodynamics, the process of doing work with heat must be inefficient. It takes a good design to reach the 30% range. Not every power plant is limited to 30% efficiency by the laws of thermodynamics. On the following pages are descriptions of some power plants that are not thermoelectric. Hydroelectric Power Plant The building houses the water turbines and generators. Water comes through the pipes from a reservoir high up the mountain side. It is the difference in altitude between the reservoir and the turbines that give the water its potential energy. 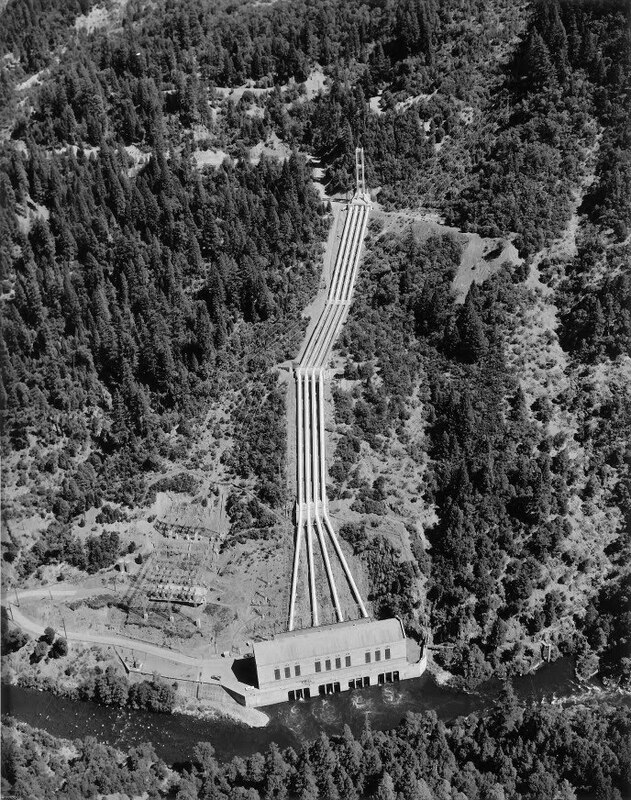 Photo courtesy of PG&E. A hydroelectric plant uses the force of gravity acting on water to drive its generators. • Large tracts of land must be submerged under reservoirs, destroying sections of land ecosystems, disrupting the life cycle of fish and aquatic ecosystems. • Reservoirs fill up with silt carried by river currents. The lifetime of a typical hydroelectric plant is 50 years until the reservoir is too full of silt to be useful. Hydroelectric power plants have already been built at nearly all of the suitable sites. The few potential sites that remain are controversial because they involve the flooding of wilderness areas. Consequently, it is not likely that any new hydroelectric power planets will be built in the United States. What is the ultimate source of the energy in hydroelectric power plants? What energy transformations occur in a hydroelectric power plant? Wind Turbines. 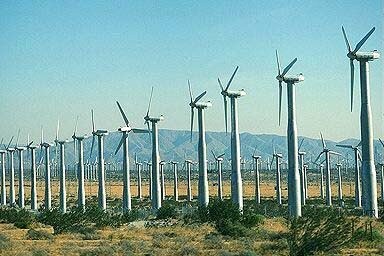 One of three huge “wind farms” located in gaps in California’s mountain ranges along Interstate 10 near Whitewater, California. Hundreds of years ago, wind power was used to turn grain grinding mills. When you drive by old farms and ranches, you often see old-style windmills that were used to pump precious water for irrigation. Most modern windmills are being used to generate electricity. For wind machines to generate significant amounts of electricity, the wind must be at least 20 miles per hour. It is wise to conduct detailed wind surveys of a site to determine annual wind variations, before deciding to install wind electric generators. •	Birds can be killed by spinning wind turbines. •	People living nearby may object to the noise and appearance of wind turbines. •	Even at windy sites, wind is an intermittent event, so wind electric generators alone cannot provide all our electrical needs. Either the generators must be linked into a public utility to supplement other electric power sources, or the wind generators must have their own system of storing electricity for use when there is no wind. Storage systems such as those used with solar-thermal electric power can be used to store electricity from wind generators. The main advantages to wind electric power generation are that it does not pollute the air or water, and has no fuel costs. What is the ultimate source of the energy in wind generator systems? What energy transformations occur in wind generator systems? Which is the best way to heat your home? How much are we reliant on fossil fuels, how will that change in 50 or 100 years, an what energy sources would be best for developing nations to consider and implement? The size of the U.S. electrical power industry is vast: 6,667 operating fossil-fuel plants; 3,352 hydroelectric plants; 107 nuclear power plants—plus all the substations and connecting power lines. The costs for running and maintaining this industry is about $200 billion per year. The impact of this industry on the environment is immense. But power plants are only part of the picture. How we get the electrical energy from the power plant to your home is the subject of the next chapter.